Add another name to the list of light heavyweights who didn't want to fight Glover Teixeira. Rashad Evans simply wasn't ready but he thinks he will be by January or February. The list of light heavyweights who wanted nothing to do with a fight against recent Octagon debutant Glover Teixeira just keeps growing and growing. The latest name to add to the list is former division champion Rashad Evans, who revealed as much on the UFC on FUEL TV 5 post-fight show last night (Sept. 29, 2012) when asked about his future and when he'll be returning to the cage: "I don't know. I talked to Dana [White] early this week and we talked about maybe December. But I'm thinking maybe January or February. I will fight anybody. I want to get a fight at light heavyweight. They offered me a fight, but it was against Glover Teixeira and I only had three weeks to fight and I haven't been training. I was like, ‘no way, not with that notice in Brazil.'" Rashad on Twitter Rashad Evans ? @SugaRashadEvans I will fight anybody with the proper notice.. But after 8yrs with the UFC & being one of their top earners. Y would I take a bad fight?! Rashad Evans ? @SugaRashadEvans Bad fight meaning not being in shape. Losing is hard enough but I will never serve myself up! If I'm haven't been training I won't fight! Rashad Evans ? @SugaRashadEvans I know alot of u fans may not realize but I don't walk around ready 2 fight. No one does. In this sport it takes at least 8wks 2 b ready! Rashad Evans ? @SugaRashadEvans Fighting another person is much harder than most ppl think & if im not training it takes time 2 get ready. There r no easy fights! Brad Pickett, Matt Wiman, Stefan Struve and Stipe Miocic each earned $40,000 bonuses for their performances at Saturday's "UFC on FUEL TV: Struve vs. Miocic" event. Pickett earned the "Knockout of the Night" award, Wiman won "Submission of the Night" and Struve and Miocic picked up "Fight of the Night" honors. UFC officials announced the winners and bonus amounts following the event, which took place at Capital FM Arena in Nottingham, England. The event's main card aired on FUEL TV following prelims on Facebook. For British slugger Dan Hardy, fighting in front of his hometown crowd was truly a dream come true. However, Hardy was focused on channeling the emotion of the moment into a positive outcome rather than the disappointing result he suffered in his most recent appearance in his native country. "Sometimes if I let my emotions get the best of me, technique goes out the window and I just want to see who's got the best chin," Hardy said. "I didn't want to take that risk again in my hometown." At just 24 years old, Dutch heavyweight Stefan Struve said there is still plenty of time for him to earn a UFC title shot. But at 6-1 in his past seven fights – and with all six of those wins coming via stoppage – the 7-footer may find his name called sooner rather than later. In the meantime, after earning a "Fight of the Night" win over the previously undefeated Stipe Miocic at Saturday night's UFC on FUEL TV 5 event, Struve has another name in mind: Fabricio Werdum. From top to bottom, Dana White was a big fan of how UFC on FUEL TV 5 had turned out. It was the promotion's debut in Nottingham, England, and mid-week, the UFC president said he could throw a dart at a board and that fight could wind up being the "Fight of the Night" winner. After Saturday's card, White's early feelings were confirmed. That is, until he was reminded of one fight in particular. NOTTINGHAM, England – Dana White thought he had Daniel Cormier's next opponent all set up. Instead, it was back to the drawing board. Cormier (10-0 MMA, 7-0 SF) was scheduled to fight former UFC heavyweight champ Frank Mir (16-6 MMA, 14-6 UFC) in about a month in Oklahoma City. 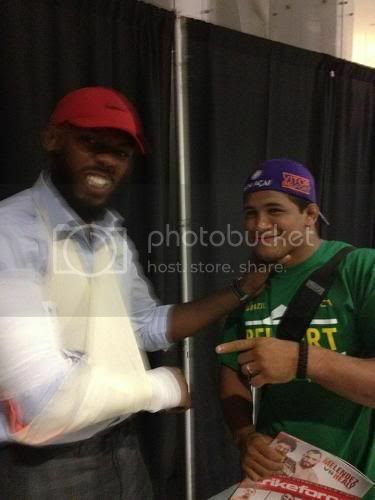 But Mir dropped out with an injury, and White and the Zuffa brass went to work on his replacement. White thought it was going to be Matt Mitrione (5-1 MMA, 5-1 UFC) – but the UFC heavyweight turned down the fight earlier this week. "It f---ing makes me sick," White told MMAjunkie.com (www.mmajunkie.com) on Saturday following the UFC on FUEL TV 5 post-fight news conference. "Listen, you don't want big opportunities, I hear you. I get it, then. All I can say is, I guess he doesn't want big opportunities. I get it. Duly noted. "He wants to fight a guy who weighs 205, but doesn't want to fight the guy who's the real heavyweight, the legitimate guy who's ranked. And Mitrione's not getting any younger." Nick Catone (9-3 MMA, 3-3 UFC) apparently has his next fight. The veteran middleweight today announced via Twitter that he's slated to fight T.J. Waldburger (15-7 MMA, 3-2 UFC) in December at The Ultimate Fighter 16 Finale. Officials, though, have made no formal announcement. The TUF 16 Finale takes place Dec. 15 at The Joint at Hard Rock Hotel and Casino in Las Vegas. Ultimate Fighter 16 coach Shane Carwin has suffered a minor knee injury that will prevent him from traveling on a scheduled trip to England this week, but he will still fight at The Ultimate Fighter 16 finale against Roy Nelson. Carwin first reported the knee injury on his Twitter account saying, “ATTN UK Fans: I hurt my knee training and I will not be able to make the signing with the amazing people @FearlessUK.” Carwin’s manager Jason Genet of Ingrained Media told MMAWeekly.com that he injured the knee while in wrestling practice, but he suffered no major tears or damage to the knee. Brian Stann thinks he beat Michael Bisping, doesn't want to fight 'up-and-comers' 167 By Jesse Holland ON SEP 26, 11:30A Tom Szczerbowski-US PRESSWIRE - Presswire UFC Middleweight Brian Stann admits bias, but still believes he was the better man against Michael Bisping at the UFC 152 pay-per-view last week in Toronto. Ultimate Fighting Championship (UFC) eliminated yet another contender from its middleweight title race following a unanimous decision win for Michael Bisping over Brian Stann at the UFC 152: "Jones vs. Belfort" pay-per-view (PPV) event last Saturday night (Sept. 22, 2012) at the Air Canada Centre in Toronto, Ontario, Canada. There's just one problem. The "All American" believes it was he -- not "The Count" -- who did enough to deserve the decision. And as he told the UFC on FUEL TV post-fight show (via MMA Torch), he's not the only one who feels that way. "[I'm] disappointed obviously. Dana came back after the fight and told me he thought I won the fight. Of course I am going to be biased, I was in there and I thought I won. I have to take an analytical view. I knew it was going to be close, but I thought I won the fight. I think I could still fight the good contenders, I don't think I go back to fighting the up and comers. I think if I get two big wins in a row, I can get right back to a fight that means something. There are a lot of us to who have gotten there, fall down and then come back. That is what I have to do." Despite a promised title shot after an impressive showing against Ryan Bader at UFC on Fox 4, Lyoto Machida is now out of the immediate title picture. He spoke with Globo Esporte on a number of topics, including UFC 152 and his desire to fight welterweight king, Georges St. Pierre, at middleweight. Lyoto Machida, one of the top Light Heavyweight Ultimate Fighting Championship (UFC) talents, was recently on the cusp of receiving a much desired rematch with current champion, Jon Jones. After his impressive knockout of Ryan Bader at UFC on Fox 4, he was promised a title shot against the winner of the Jon Jones vs. Dan Henderson fight that was scheduled for UFC 151.